One of the striking "I Belong" campaign images created by United Colors of Benetton. The United Nations refugee agency today launched a global campaign aimed at ending within a decade the problem of statelessness – a legal limbo for the more than 10 million people worldwide who lack a nationality and the human rights protections that go with it. The Office of the UN High Commissioner for Refugees (UNHCR) partnered with the United Colors of Benetton to create the I Belong, campaign which aims to draw global attention to the life-long consequences of statelessness. In a press release detailing the initiative, UNHCR underscored that every 10 minutes, a baby is born stateless. Since they are not allowed a nationality, these children are often denied the rights and services that countries normally offer their citizens. Moreover, 27 countries currently deny women the right to pass their nationality onto their children on an equal basis as men, which can create chains of statelessness spanning generations, according to the statement. “Statelessness makes people feel like their very existence is a crime,” the UN High Commissioner for Refugees, António Guterres, said in the statement, which noted that most situations of statelessness are due to discrimination based on ethnicity, religion or gender. “We have a historic opportunity to end the scourge of statelessness within 10 years, and give back hope to millions of people. We cannot afford to fail this challenge,” he added. The open letter will become an online petition on the campaign's website, which, along with the creative content, was developed by Benetton. The aim is to collect 10 million signatures in support of ending statelessness within 10 years. UNHCR Special Envoy Angelina Jolie was among the first to sign the open letter. “Being stateless means you and your children having no legal identity, no passport, no vote, and few or no opportunities to get an education,” Ms. Jolie said in the press release. “Ending statelessness would right these terrible wrongs. But it would also strengthen society in countries where stateless people are found, by making it possible to draw on their energy and talents. It is both an obligation and an opportunity for governments everywhere to put an end to this exclusion,” she added. Additional signatories to the open letter include, among others, Zeid Ra'ad Al Hussein, High Commissioner for Human Rights; Anthony Lake, Executive Director of the UN Children's Fund (UNICEF); Helen Clark, Administrator of the UN Development Programme (UNDP); and Archbishop Emeritus Desmond Tutu. UNHCR also released today a Special Report on Ending Statelessness within 10 Years, which highlights the human impact of the phenomenon, and a 10-point Global Action Plan to End Statelessness that aims to resolve major existing crises and to ensure that no child is born stateless in the future. Despite some progress, the report notes, new risks of statelessness have emerged as a result of growing numbers of major conflicts worldwide. The wars in the Central African Republic and Syria, for example, have forced millions of people into internal displacement or into becoming refugees. In addition, tens of thousands of children have been born in exile, and UNHCR is working closely with the governments and partners in countries receiving refugees on prioritizing birth registration for those children. While issues of statelessness remain politically contentious in some countries, in others ending it can be as simple as changing a few words in a country's citizenship law, the press release notes. Over the past decade, 4 million stateless people have been able to acquire a national or have their nationality confirmed as a result of legislative and policy changes. This year marks the 60th anniversary of the 1954 UN Convention relating to the Status of Stateless Persons, which, along with the 1961 Convention on the Reduction of Statelessness, provides the international legal basis for ending statelessness. As of 4 November, there were 83 state parties to the 1954 Convention relating to the Status of Stateless Persons, and 61 to the 1961 Convention on the Reduction of Statelessness. Just three years ago, there were barely 100 States parties to the two statelessness treaties, the press release noted. 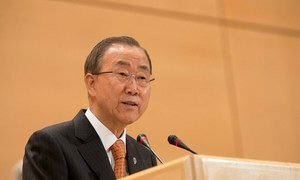 Amid mounting crises, a warming planet and the spread of contagious diseases, the world is being consumed by “many troubles,” United Nations Secretary-General Ban Ki-moon said today as he pressed the international community to engage in “unprecedented cooperation” as it faces a slew of global predicaments.